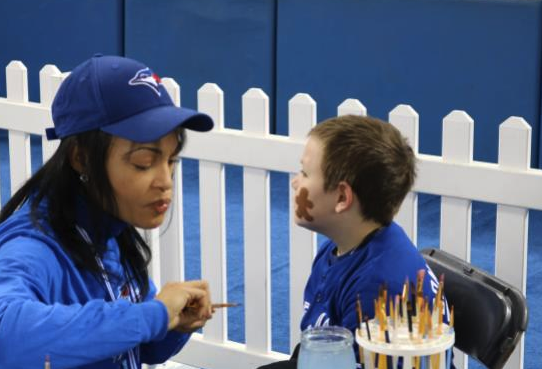 The Toronto Blue Jays welcomed hundreds of fans into the Rogers Centre for their annual Winter Fest. 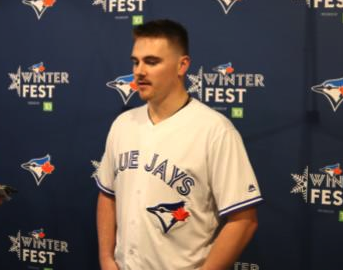 Roster hopefuls Reese McGuire and Cavan Biggio spoke about their game plan for this upcoming season, while the always entertaining, Joe Biagini did his best to answer all the questions thrown his way. Being a part of the Jays ‘Youth Movement,’ 23 year old catcher Reese McGuire, played in 14 games for the Jays last year. “Being around Russell was a pleasure, I was able to play with him when I was a young rookie in the Pittsburgh system,” McGuire said after being asked about what he had learned from Russell Martin, who was traded to the Dodgers just a few weeks ago. Joe Biagini speaks to a reporter about the upcoming season. Lastly Joe Biagini stepped up to the podium, after a year where there was a lot of uncertainty of where he belonged on the team, as he served duties out of the bullpen and as a starter. 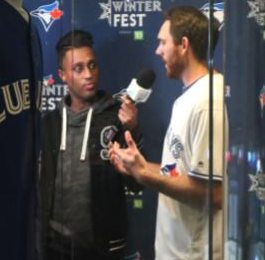 “I don’t know if I do this perfectly, but I always try to remind myself just how unbelievable it is that I would be desired, to come here and sign autographs and take pics with the fans, I always try to make every interaction memorable.” Biagini said, on a lighter note, about his time at Winter Fest. As they look to the future, all three players agreed on one thing, they can’t wait to get back on the field, in a Jays uniform.